Classic and elegant describes this gourmet gift basket. 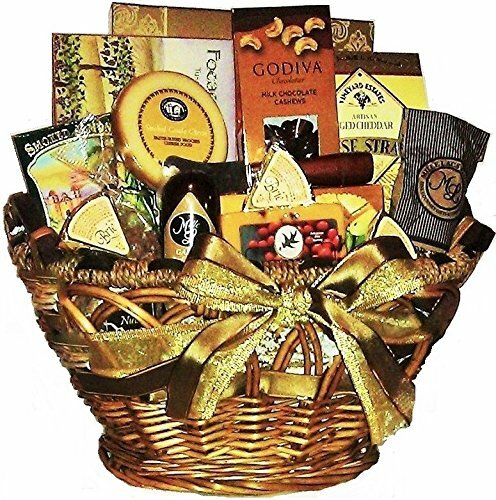 Classic and elegant describes this gourmet gift basket perfect for every occasion. Includes Smoked Gouda Cheese, Brie Cheese Wedges, Cranberry Cheddar, Spreader, Salami, Sausage, Deluxe Nuts, Tuscan Crackers and accompaniments, Belgian Cookies and Truffles. Wrapped with clear cellophane and tied with gold ribbon. Perfect for Business Gifts, Holidays and Every Occasion.